A funny anecdote if I may (cue the chorus of boos). I've had this beer once (yes, great story so far), but when I picked it up, it had been on the shelf for months, which is not exactly the ideal situation you want from a fresh-hopped ale. So I finally get to try this one when it is actually, you know, fresh. 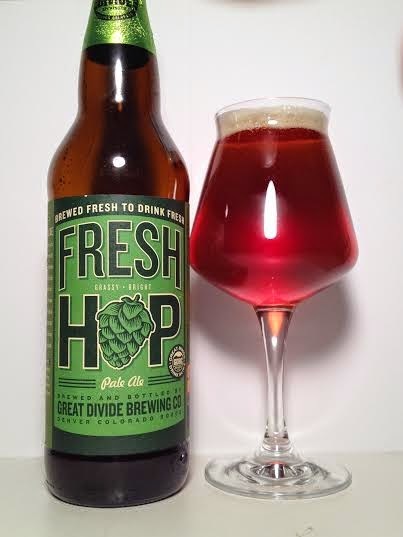 What is a fresh-hopped ale? When hops are picked, they either have to be used for brewing that very same day, or the hops have to be dried and processed to preserve for later use. Using them for immediate brewing is called wet-hopping (or fresh-hopping). Typically this is done for IPA's and Pale Ales. Supposedly it gives the beer just an extra tinge of freshness, but some have debated on whether or not it really makes a difference and have called wet-hop ales a gimmick. Whatever, I just want some great beer. Pours a dark, rust orange, bordering on copper or amber. It's transparent and gave a finger of white head. I know Colorado isn't exactly the West Coast, but man this is dank as all hell. Smells like a lot of typical West Coast IPA's, but the garlic/onion is cranked up in this one. Very earthy and mossy, but also fresh and clean. The taste is like a mouthful of freshly cut grass. Just huge floral and grassy hops with a residual onion flavor. Most IPA's/APA's are bitter up front, but a pop of bitter hops actually hits you on the finish on this one. Above all else, I'm surprised at how damn malty this beer is. Granted, it's not off-putting, but it's not the what I would want as a dominant taste. For a 6.10% APA, this seems thicker than most examples of the style. Some good carbonation and no unpleasant lingering flavors. Overall, Great Divide Fresh Hop Pale Ale does taste fresh, but an overabundance of malts takes away from fresh hoppy goodness. Still, those herbal hops are still prominent enough to make this an enjoyable experience. Just be ready for a malt bomb.